“In that flickering pallor it had the effect of a large and clumsy black insect, an insect the size of an ironclad cruiser, crawling obliquely to the first line of trenches and firing shots out of portholes in its back. And on its carcass the bullets must have been battering with more than the passionate violence of hail on a roof of tin”. Herbert Wells, the British author, wrote this text in 1903, thirteen years before the first armoured vehicles rolled over the Somme River. His imagination and foresight inspired military engineers to develop armoured vehicles equipped with guns, and significantly changed the face of modern warfare. This prophetic story was known as “The Land Ironclads”. Nevertheless, the war reached a deadlock. The war correspondent who listened to the lieutenant complained that there was not much to write about. The ironclad monsters appeared right when the correspondent came up with the name for his article about the war losing intensity. “What could one be expected to do against ironmongery?” said a cavalry officer who encountered land ironclads and realised that his favourite service arm is no longer competitive. The new vehicles used by the townsmen rumbled and flooded the battlefield with searchlight, which immediately discouraged the defenders. Born warriors and cowboys hurried to leave the frontline. Under no circumstances were they going to give up! They held their advantageous positions. They had heavy artillery and numerous horsemen, and they were prepared for battle. When the sun rose, the correspondent and the soldiers were able to have a clear look at the enemy's steel giants. From above, the land ironclads were protected by segmented armour, that looked like a turtle's shell. The entire suspension was covered with a flexible metal skirt, and the sides were covered with portholes, rifle barrels, and telescope tubes. The vehicles were equipped with rather inventive telescope sights. These were obscura-cameras: ancient devices that displayed a bright object on the screen in front of the riflemen, who were not required to risk their lives. A rifleman was sitting in the well-protected armoured vehicle, adjusting the projection scale with dividers. When the reticle was on a target, the rifleman grasped a knob to fire a shot. The system worked reliably. Generally, the adjustment fire required up to two shots. The vehicles had “foot wheels” instead of tracked suspension. The British engineer B.J. Diplock developed these wheels. Levelers were used as wheel spokes, while metal blocks were used as wheel rims. Three of these feet touched the ground at all times, in order to make the vehicle stable. Diplock named his invention the “Pedrail”, which literally means “foot-rail”. 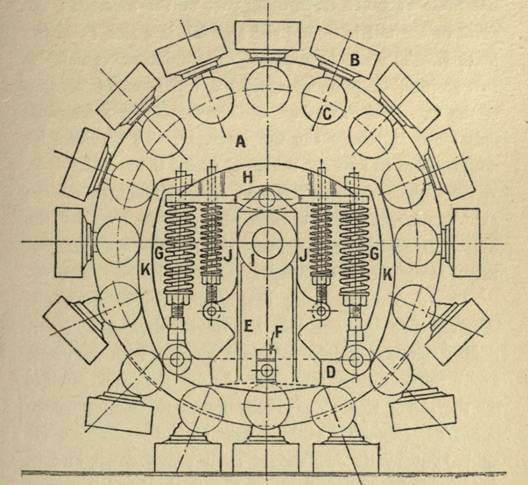 Although Diplock was not the first to invent such a mechanism, his “Pedrail” became popular because of the story by Wells. However, the vehicles featured poor communication abilities. They were not equipped with radios, and so the crew used speaking tubes for internal communication and signal flags for external exchanges. This did not prevent the "devitalized" townsmen from breaking through the enemy defences though. The ironclads broke through the trenches and secured them with fire. The countrymen lost the counterbattery artillery duel, while the ironclads were supported by infantry who protected the vehicles from enemy horsemen. There was not much fiction at all in “The Land Ironclads”. Ivan Block (the Russian merchant and sophist) described the positional deadlock in frightful detail. The British Army used railless trains when fighting against the Boers in South Africa from 1899–1902, and the battle in the story resembled real reports delivered by war correspondents. Only the giant vehicles were fictional. Winston Churchill said that Wells described armoured vehicles as credibly as possible using merely imagination. No wonder that first of all engineers referred to Wells' ironclads when developing the "land cruisers". Wells H. G. The Land Ironclads // The Strand Magazine. December 1903. Vol. 26. P. 501-513. Anglo-burskaya voyna 1899–1902 godov glazami rossiyskikh poddannykh. V 13 tt. T. 5. M., 2012. Belash Ye. YU. Mify Pervoy mirovoy. M., 2012. Fedoseyev S. L. Tanki Pervoy mirovoy. M., 2012. Images from Strange Magazine, December, 1903. Follow the history of the tank, from the pages of science fiction to its reality on the battlefield!